Dallas ebola family members: Told to stay home. 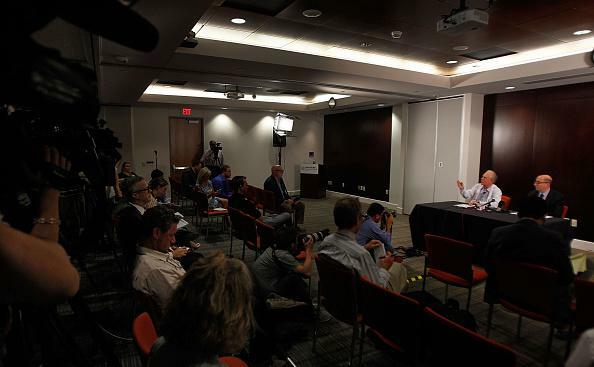 A press conference at Texas Health Presbyterian Hospital Dallas, where the patient is being treated. The order was hand-delivered to the family at the Ivy Apartments, in northeast Dallas, on Wednesday night and legally requires the four relatives of Duncan to stay home until at least Oct. 19. “The order is in place until the incubation period has passed and the family is no longer at risk of having the disease,” a news release from Dallas health officials said. The family must also provide blood samples, agree to any other testing and report any symptoms to the Dallas County Health and Human Services Department immediately, including any fever above 100.5 degrees, headache, nausea, diarrhea or abdominal pain. Ebola patients are not contagious unless they show symptoms of infection. None of the “12 to 18” people who had contact with the Dallas patient—whose name is Thomas Eric Duncan—and are being monitored for symptoms have yet developed any. Duncan is in his mid-40s and is a resident of Monrovia, Liberia’s capital, where the Ebola outbreak has been devastating. He’s thought to have become infected while helping transport a neighbor who suffered from the disease to a hospital. She was turned away for lack of space and died soon after.